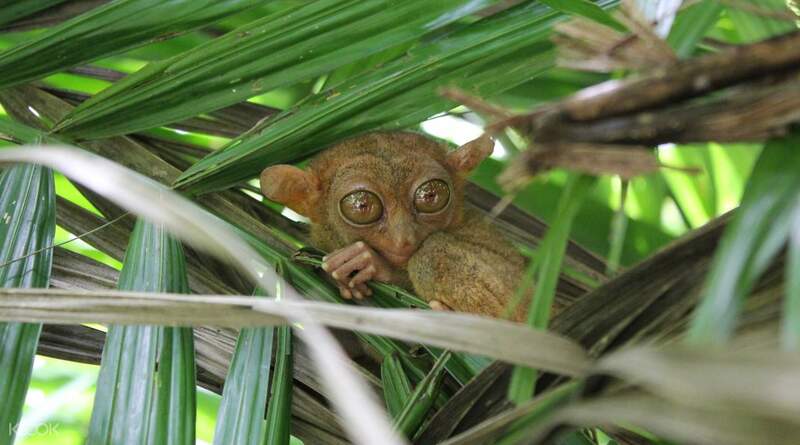 Catch a glimspe of the world's smallest primate - the tarsier! Discover the natural beauty of Bohol’s countryside on an 8 hour tour. Known for its stunning coral reefs, unusual geographical formations and the world’s smallest primate, Bohol is a popular tourist destination with a lot to offer. Start with a convenient early morning pick up and hop on a ferry to get to Tagbilaran. Upon your arrival at Tagbilaran Port, you get to see the famous Tarsiers - these cute big-eyes creatures can only be found here. 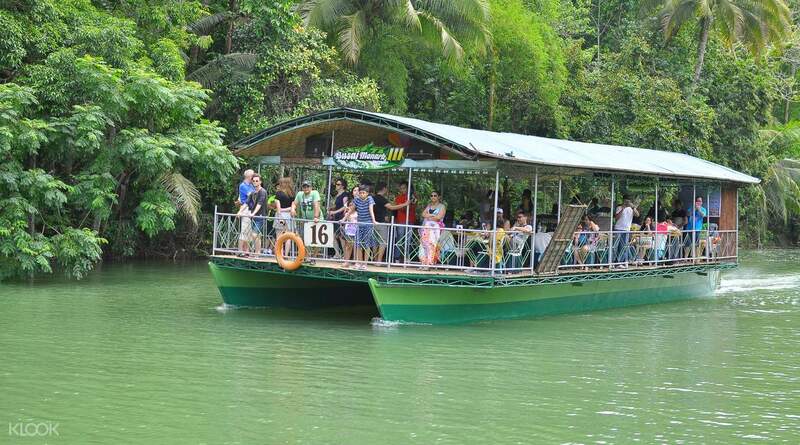 Enjoy your lunch aboard the Loboc River Cruise. Sail past breathtaking landscapes on the floating restaurant as you feast on savory local delicacies. 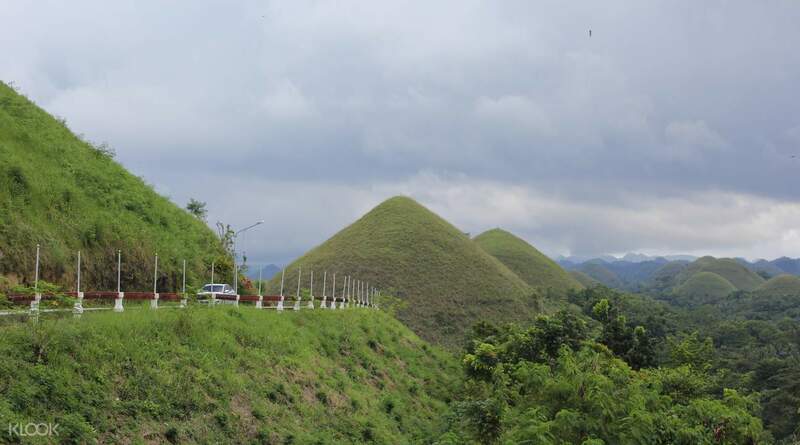 Go on to see the famous Chocolate Hills, one of the region’s prime attractions. Visit a Butterfly Sanctuary and go sightseeing at Bilar manmade forest. Your trip concludes with Baclayon Church & Museum and the Sandugo, the blood compact monument symbolizing the first treaty of friendship between the Spaniards and Filipinos. Tour was amazing plus our great driver kuya jeffrey. He let us try loboc zipline even though its not in our itinerary. He drives fast and smoothly. River tour is very good but the food is just ok. Overall, a highly recommended tour. Tour was amazing plus our great driver kuya jeffrey. He let us try loboc zipline even though its not in our itinerary. He drives fast and smoothly. River tour is very good but the food is just ok. Overall, a highly recommended tour. Even though this isnt as thrill seeking as the other trips in the Phillipines there is an option to add on a quad bike tour but remember to take 1000 peso each with you and keep it till the end of your day trip. We got picked up from our hotel at the stated time by Rey and taken to the ferry port in Cebu, this was the most straight forward of all the ferry ports we have been to throughout our trip. At the other end we were met by sherwin who was holding my name up on a board. He was a great tour guide and also a local to Bohol so he new a lot about the area and answered all the questions we had. It is a beautiful island with a Spanish influence. We stopped off at The bloodcompact monument between the Spanish and the Philippino people (Sandugo shrine) We stopped off at the church Baclayon church. We stopped in the man made Forrest full of mahogany trees. Which was very pretty. We had a stop at a wildlife centre with the biggest pythons on the island, which has now died and since they have all of its bones in a museum part. There is also the opportunity to hold pythons and see a 200kg live python. However if this isn’t your thing the driver could bypass this and take you to the Loboc River early. The river tour was exciting. You eat buffet style and get sung to as you make your way down the river. You then meet the ati tribe. Then to end the trip some beautiful views of the chocolate hills. Sherwin ensured we got on the ferry boat and helped us get our tickets at the other end. Myself and my friend really enjoyed the trip and sherwin was fantastic. Even though this isnt as thrill seeking as the other trips in the Phillipines there is an option to add on a quad bike tour but remember to take 1000 peso each with you and keep it till the end of your day trip. We got picked up from our hotel at the stated time by Rey and taken to the ferry port in Cebu, this was the most straight forward of all the ferry ports we have been to throughout our trip. At the other end we were met by sherwin who was holding my name up on a board. He was a great tour guide and also a local to Bohol so he new a lot about the area and answered all the questions we had. It is a beautiful island with a Spanish influence. We stopped off at The bloodcompact monument between the Spanish and the Philippino people (Sandugo shrine) We stopped off at the church Baclayon church. We stopped in the man made Forrest full of mahogany trees. Which was very pretty. We had a stop at a wildlife centre with the biggest pythons on the island, which has now died and since they have all of its bones in a museum part. There is also the opportunity to hold pythons and see a 200kg live python. However if this isn’t your thing the driver could bypass this and take you to the Loboc River early. The river tour was exciting. You eat buffet style and get sung to as you make your way down the river. You then meet the ati tribe. Then to end the trip some beautiful views of the chocolate hills. Sherwin ensured we got on the ferry boat and helped us get our tickets at the other end. Myself and my friend really enjoyed the trip and sherwin was fantastic. the trip was wonderful. we enjoyed every minute of it. A big thanks to kuya Ian (our driver/guide/photographer)for being so nice to us. he even let us try the atv even if it was not on our iterinary. looking forward for more adventures next time! the trip was wonderful. we enjoyed every minute of it. A big thanks to kuya Ian (our driver/guide/photographer)for being so nice to us. he even let us try the atv even if it was not on our iterinary. looking forward for more adventures next time! Highly recommended. Inspite of minor problems with Cebu pick-up van we still are grateful and thanking the Klook's driver in Bohol for his very friendly, accommodating assistance, arrival and departure. The private van was very comfortable as well. The Bohol package tour included the buffet lunch at the floating restaurant which was good for a day tour. Highly recommended. Inspite of minor problems with Cebu pick-up van we still are grateful and thanking the Klook's driver in Bohol for his very friendly, accommodating assistance, arrival and departure. The private van was very comfortable as well. The Bohol package tour included the buffet lunch at the floating restaurant which was good for a day tour. Almost everything in our bohol trip is ok. We love the tarsiers and chocolate hills and the baclayon church is so beautiful and also the man made forest. Almost everything in our bohol trip is ok. We love the tarsiers and chocolate hills and the baclayon church is so beautiful and also the man made forest. Tour was excellent. we have a great experience! thanks to island trek and to kuya sherwin our driver, photographer and tour guide. all are in according to schedule. Tour was excellent. we have a great experience! thanks to island trek and to kuya sherwin our driver, photographer and tour guide. all are in according to schedule. Driver pickup was on time, drove to the ferry terminal and took the ferry to bohol! Upon arrival we met up with the guide, yo-yong. We started on a bad note bcoz the guide seemed like he was rushing to get over and done with. He said “if everything can end early we can go take ferry back early”. Like we JUST arrived and u are already rushing us to end the day tour early -.- Anyway we saw the blood compact monument, went to the church and museum, and the butterfly sanctuary + python which was really cool! Then we went for a nice river cruise and lunch buffet (food was alright only don’t expect too much) but view was nice with singer on board. Then we got to see the tarsiers, sadly it rained quite badly with huge tourist groups so we didn’t enjoy it that much but the tarsiers were really adorable!! Then our driver dropped us off for ATV (optional and payable) and we decided to take it before going to the chocolate hills. Chocolate hills was super scenic!!! Great way to end the tour. Took a long ride back to ferry terminal before calling it a day. Thanks Klook!! Driver pickup was on time, drove to the ferry terminal and took the ferry to bohol! Upon arrival we met up with the guide, yo-yong. We started on a bad note bcoz the guide seemed like he was rushing to get over and done with. He said “if everything can end early we can go take ferry back early”. Like we JUST arrived and u are already rushing us to end the day tour early -.- Anyway we saw the blood compact monument, went to the church and museum, and the butterfly sanctuary + python which was really cool! Then we went for a nice river cruise and lunch buffet (food was alright only don’t expect too much) but view was nice with singer on board. Then we got to see the tarsiers, sadly it rained quite badly with huge tourist groups so we didn’t enjoy it that much but the tarsiers were really adorable!! Then our driver dropped us off for ATV (optional and payable) and we decided to take it before going to the chocolate hills. Chocolate hills was super scenic!!! Great way to end the tour. Took a long ride back to ferry terminal before calling it a day. Thanks Klook!! Great experience of the tour, good arrangement and timely from Klook. Great experience of the tour, good arrangement and timely from Klook.